By Chris Lang, MSc Thesis, Oxford University, 1996. Those involved in the promotion of the pulp and paper industry maintain that demand for paper products is increasing, and must be met. Paper consumption per capita and “development” go hand in hand in this context, as if by increasing paper consumption a rise in living standards will automatically occur. The United Nations Food and Agriculture Organisation (FAO) for example, states: “That paper is a commodity vital to the growth and development of every country, its communications and packaging, is beyond dispute” (FAO 1986: 3). The “paperless office” is viewed as a “threat” by the captains of the pulp and paper industry (e.g. Erickson 1996: 160), and demand is seen as something that “has to be stimulated” (Clark 1994 cited in Kerski 1995: 144). In 1993, the South, plus Eastern Europe, with 84 per cent of the world’s population consumed less than 25 per cent of its paper products, while the North with only 16 per cent of the population consumed over 75 per cent (Kerski 1995: 144). According to the industry view, however, low per capita paper consumption is a “growth opportunity”, small scale paper mills are “inefficient” or “uneconomic”, and countries of the South are “opening up for investment in the pulp and paper industry” (Johansson 1996: 25). To meet this perceived demand for paper products, there is an flourishing trade in the commodities involved in the manufacture of paper, as well as in paper products themselves. Raw materials, initially in the form of logs, then wood chips and increasingly dry pulp form an expanding part of world trade. This trade has developed rapidly since the early 1960s, when most international wood fibre trade was between the United States (US) and Canada and between Europe and Scandinavia. Japan was one of the first countries to look at expanding its supply base of raw materials for pulp and paper manufacture, and the growing needs of the Japanese pulp and paper industry from the early 1960s was a major factor in the creation of an international wood chip trade (Schreuder and Anderson 1988: 174). Japan became a dominant player first in the world wood chip market, and subsequently the dried pulp market – by 1993 Japan was the second largest importer of pulp in the world (Pappens 1994: 24). Until the 1960s, Japan’s only source of overseas pulpwood was the USSR, but during the 1960s, Japan began importing sawmill residues and wood chips from old-growth forests from Canada and the United States. (Shimokawa 1977: 27, Schreuder and Anderson 1988: 169). By the mid 1970s shortages of pulp wood supplies were predicted, and the Japanese Ministry of Trade and Industry (MITI) pointed to hardwood forests in Brazil and South East Asia as “promising as potential sites for Japanese pulpwood ventures” (World Wood 1976a: 5). Some of the factors leading to other paper manufacturing countries following Japan in looking for new sources for pulpwood are described below. Before the mid 1960s most raw wood fibre was transported in the form of logs. In 1964 Japan constructed the first ocean going vessel designed specifically for the transportation of wood chips. By the late 1980s there were over 100 of these ships, almost all owned by Japan (Schreuder and Anderson 1988: 163) each with a carrying capacity varying between 20,000 to 50,000 tonnes (Shimokawa 1977: 27). Due to the considerable economic benefits in transporting fibre as the standardized, international commodity of wood chips, the proportion of pulp wood imported as logs decreased from 99.8 per cent in 1960, to only 1 per cent by 1985 (Schreuder and Anderson 1988: 168). By the end of the 1970s, Japan was heavily dependent on supplies of wood chips from the US. In 1979, however, US interest rates increased, leading to a slump in the housing industry, in turn resulting in a reduction of production from sawmills and plymills. The reduction in mill residues led to a shortage in an important source of raw material for wood chips, and because demand was still high, both domestically and in Japan, the price of chips increased. Weyerhauser for example increased the price of Douglas Fir wood chips by 138 per cent over a six month period. This hike in prices became known in the Japanese pulp and paper industry as “chipshock” (Schreuder and Anderson 1988: 176). In 1980 “chipshock” led to Japanese pulp and paper manufacturers petitioning the government to allow more timber to be thinned from domestic forests, to encourage the production of timber from privately owned forests in Japan and to help promote the domestic chip industry (World Wood 1980b: 37). However, the inaccessibility of Japan’s forests, fragmented forest ownership and competition from other forest users, as well as the fact that world chip prices declined gradually after 1981, meant that a large increase in domestic production of chip wood supplies was not realized (Schreuder and Anderson 1988: 177). At least until the early 1950s, the ample supplies of long-fibred pulp in temperate regions led to a reluctance on the part of the pulp and paper industry to utilize short-fibred hardwood pulp. However, forecasts of a future shortage of long-fibred pulpwood encouraged research into pulps from Birch, Beech and Eucalypts, which were found to be very suitable for certain grades of paper production (King 1977b: 22). The development of technology for utilizing short-fibred pulps from tropical hardwoods followed, and by the mid 1970s mixed tropical hardwoods could be utilized for pulp production on a commercial scale (King 1975: 2). Supply of hardwood has duly increased, as forests have been cleared in Papua New Guinea, Malaysia, Brazil, Thailand, the Philippines, Indonesia and elsewhere in the tropics (Richardson 1977: 12). The highest value species are sawn, while the rest are run through a whole chipping process producing nonhomogeneous “jungle wood” which is exported. The whole tree chipping operation in Madang, Papua New Guinea, for example, is one of the largest operations in the world dedicated to chip exporting. (Schreuder and Anderson 1988: 172-3). Often these forests are in remote rain forest or mangrove areas, giving various advantages to the chipping operators, including: low or no populations; few problems of land tenure or traditional usufruct rights; environmentalists will only get to hear about the project when it is underway or complete; impact statements will not be necessary; and a lack of local labour means that operators can with impunity bring in their own labour force (Richardson 1977: 13). Demand for hardwood pulp meanwhile has increased with the use of computers and photocopiers in offices, which require paper products such as fine writing paper, computer and copy paper which are manufactured from hardwoods. During the early 1990s logging in western North America and Canada decreased dramatically, due to both the depletion of old-growth forests without sufficient replanting, and a rise in environmentalism (Lohmann 1993: 2). In 1993, for example, almost 1000 people were involved in the largest mass arrest in Canadian history, over a protest at the logging of old-growth forest for pulpwood in Clayoquot Sound, Vancouver Island (Kerski 1995: 142). These combined factors have pushed the pulp and paper industry worldwide into diversifying its raw material supply base. From the mid 1970s onwards Japan started laying plans for new supplies from a wide range of countries in South America, Africa, Oceania and South East Asia. Such diversity of supply not only ensures a constant supply but has the added benefit of maintaining low prices through competition between these countries (Lohmann 1994: 2). This diversification of supply has involved finding new sources of old growth forests and establishing new plantations of fast growing trees specifically for pulp wood. Old growth forests in the southern US and the interior of Canada were targeted initially. For example, in 1980 the Japanese paper companies, Oji Paper and Daio Paper, announced plans to import southern pine woodchips from Woodfiber Marketing Corporation, a supplier in the US southern state of Georgia, via the Panama canal. The shipping distance is double that of the US west coast to Japan route, indicating the seriousness of the wood chip supply problem in Japan (World Wood 1980c: 5). 1. Species can be chosen for specific or various purposes and technologies; the forests can be tailor-made to the nation’s requirements. 2. The locations of these forests can be chosen, not only to take advantage of the physical and climatic conditions most suitable for the growth of particular species, but also to take advantage of port facilities, other infrastructure, and the availability of labour, both skilled and unskilled. 3. The growth rates of plantations are generally much higher than those of the natural forests. 4. The cost of producing a unit of wood is often much lower in a plantation than in a natural forest. 5. It is more economic to engage in silvicultural practices such as fertilization and tree breeding in plantations than it is in natural forests (King 1975: 3). As Lohmann points out, there are several other factors that make the move to industrial plantations in the South so attractive: the cheapest sites for plantations are in the South; since rates of growth are faster in the tropics than in the North trees reach rotation age earlier, and less land is required for plantations; labour is inexpensive; political repression is often severe, thus making local resistance to plantations less likely; Southern governments often pass land use laws with state handouts to encourage reforestation; and finally, in the case of South East Asia, the consumption of paper products by the “economic tigers” is growing at an unprecedented rate (Lohmann 1994: 2). It would be wrong to think however, that the plantation boom in the South is taking place within the context of a global free-market economy. Increasingly the pulp and paper industry has worked to ensure that “aid” money continues to be available, to manipulate public opinion, to manage resistance to plantations, pollution from mills and waste, and to secure and promote its own position. in the formulation of developmental policies for the pulp and paper industry, and in examining the economics of that industry, individuals, or groups of individuals, or corporations, which influence governments cannot be ignored. … very few economic decisions are today left to be solved in the market place (King 1977a: 2-3). Success is measured by the freedom to plant fiber crops … The message needs to be short, nontechnical and fundamental: for example, “Trees are good. We need more trees not less.” … Our objective should be to create and move inside an ever-increasing friendly circle of public opinion (Wilson and Fernandez Carro 1992: 52). Despite the huge size and power of the pulp and paper corporations (some 50 paper companies account for half of world production, and the sales of the biggest, International Paper, rank above the Gross Domestic Products of more than 75 countries (Kerski 1995: 146)), the plantation boom “is not the consequence of a conspiracy among a small group of like-minded industrialists implemented with the careless ease of omnipotence” (Carrere and Lohmann forthcoming). Social structures and networks beneficial to pulp and paper elites, are formed and encouraged through the political efforts of a wide range of agents, with different backgrounds, motivations, interests, education, and culture working together in an “ad hoc and sometimes uncoordinated fashion” (Kerski 1995: 142). Some of these organizations, networks, social structures and their roles in promoting the pulp and paper industry are discussed below. King points out that many developing countries cannot afford to even borrow the amounts of capital needed to set up a large capacity pulp and paper mill, but the “international clubs of consultants” continually recommend precisely such large scale developments (King 1977a: 7). Indeed, Northern forestry consultancy firms have often been the first to investigate the possibilities of industrial plantations in the South. The largest forestry and engineering firm in the world, the Jaakko Pöyry Group, has played a key role in encouraging large scale pulp and paper projects in several Southern countries. The business intelligence for assessing and developing project opportunities. The group has more than 300 experts throughout the world supporting forestry and forest industry management with facts, ideas and solutions. With these resources, we can consider forestry and forest industry from a global perspective (Pöyry 1994:3). Pöyry’s involvement in Indonesia is typical of the company’s role in a country’s forestry development. Between 1979 and 1993 the group won over 110 contracts in Indonesia, ranging from industrial forest plantation and pulp mill projects to a contract for overseas training in Brazil. In 1984 Pöyry won a contract from the World Bank aimed at “strengthening the structure of the Indonesian pulp and paper industry” (Pöyry no date: 1-10(10)). The project leader for this project was Jouko Virta, who had set up Jaakko Pöyry’s Jakarta office in 1983 (Virta 1996). A series of lucrative contracts followed for both Jaakko Pöyry and Scandinavian pulp and paper machinery manufacturers, as Indonesia’s production of pulp grew at an average of 29 per cent per annum between 1980 and 1991. Between 1990 and 2000 production is planned to treble. Pöyry has played a significant role in creating this pulp and paper industry, which has displaced thousands of indigenous people and stripped hundreds of thousands of hectares of forest, to be replaced by fast growing monocultures. Meanwhile Finnish exports to Indonesia are booming, jumping from nil in 1990 to over US$95 million in 1993, and consisting largely of machinery for the pulp and paper industry (Lohmann 1994: 3). One pulp and paper operation which has benefited from the attentions of Jaakko Pöyry is the Indah Kiat mill in Riau province in Sumatra. Pöyry has carried out 10 contracts for PT Indah Kiat, beginning in 1987 with a mission to produce a preliminary study for a pulp mill in Sumatra. Pöyry’s involvement continued with a reforestation plan for fast growing species, technical assistance for the pulp mill, assistance with the nursery and plantation establishment, through to technical studies on the machinery utilized at the mill (Pöyry no date: 2-7(10)). Indah Kiat (meaning beautiful and strong) has a 300,000 hectare HTI kayu serat concession (the maximum area for an Industrial Forest Plantation producing wood fibre for pulp and paper (WALHI and YLBHI 1992: 63)). The concession was originally forest and included ancestral lands belonging to the Sakai people, who have been resettled outside the area (Carrere and Lohmann forthcoming). Under the rules of the concession, the land must be replanted after clear cutting, and the forest is being replaced, primarily with Acacia mangium monoculture. Until the plantations reach rotation age (the first were planted in 1987-88, on a seven year cycle) mixed tropical hardwoods were utilized exclusively to run the mill. By 1998 it is planned to run the mill entirely on plantation wood (Pappens 1993: 21). Much of the labour for the clearcutting and plantation was supplied through the Indonesian government’s transmigration programme (Carrere and Lohmann forthcoming). Machinery for the mill came initially from Taiwan – a second hand pulp line from one of Indah Kiat’s Taiwanese partners, Chung Hwa. A new line under construction in 1993 was supplied by Kamyr, a woodyard from Kone and power and recovery boilers from Ahlstrom, all Scandinavian-based firms (Pappens 1993: 21-22). The example of Indah Kiat is typical and the suppliers of pulp and paper machinery tend to be based in the same northern countries as the consultancy firms. The supply of machinery to mills in the South is common, and the majority share of machinery supply contracts goes repeatedly to Scandinavian, Japanese and North American firms (Kerski 1995: 146). Economic recession in Finland, coupled with a forestry industry suffering heavy losses at home leading to cost cutting and layoffs (Rinne 1994: 20), has increased the importance of the overseas market for sales of Finnish pulp and paper machinery. Most industries form associations and alliances to promote their interests, both at home and abroad, and in the case of the pulp and paper industry these organizations can be extremely powerful. For example, the European Confederation of Paper Industries (CEPI) represents the paper and forestry industry associations of 14 countries, the Association of Brazilian Cellulose Exporters (ABECEL) represents five corporations controlling around 350,000 hectares of eucalyptus plantations (ABECEL undated cited in Counsell forthcoming), the European Tissue Symposium (ETS) represents manufacturers accounting for more than 90 per cent of European tissue paper production (Barrett 1995 cited in Counsell forthcoming), and the Canadian Pulp and Paper Association’s (CPPA) members account for almost all of Canada’s pulp and paper production (CPPA undated cited in Counsell forthcoming). Such associations help make sure firms win concessions and subsidies, assess markets, deal with public relations, lobby to influence environmental legislation, and help promote the industry as a whole on issues such as recycling, dioxin emissions or chlorine free paper production (Kerski 1995: 146). 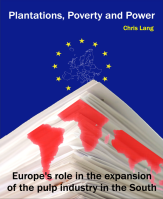 The influence of industry associations on the European Union eco-labelling scheme for paper products is relevant in this context. Initiated in 1992, the eco-labelling scheme aims to promote products with a reduced environmental impact, and to provide customers with better information (Erskine and Collins 1996 cited in Counsell forthcoming). Several criteria were to be checked for each paper product. As initially proposed, paper manufactured entirely from recycled materials would be at an advantage, whereas that manufactured from virgin fibre would have been effectively excluded from the scheme. Counsell reports that although the criteria for tissue products were affected by extensive pro pulp and paper industry lobbying, concerns remained within the trade, and a boycott of the eco-labelling scheme on tissue products by CEPI and ETS members meant that by May 1996 only two manufacturers had applied for the eco-label for tissue products (WRM 1996: 1). The committee responsible for drawing up criteria for fine paper products was put under “heavy pressure” by industry groups to include some products based on virgin fibre, from both plantations and primary forest, in the scheme. As a result, the criteria for paper products agreed by May 1996 are “extremely weak”, according to the EU project of the World Rainforest Movement (WRM 1996: 1); “cast doubts as to the credibility of the eco-labelling system for paper products” according to WWF; and were opposed by the German Environment ministry and the Consultation Forum for the European Eco-label (Counsell forthcoming). Trade journals such as Tappi Journal, Pulp and Paper International, World Wood, Paper Asia News, Paper Magazine and so on provide important fora for the industry point of view. In addition trade journals, corporations and trade associations sponsor and organize conferences aimed at promoting the exchange of technical information between engineers, economists and scientists. At some recent trade conferences the views of Greenpeace have been controversially presented (IIED 1995b: E104). In the context of the pulp and paper industry, aid serves as a means of subsidizing through public money, the work of Northern corporations in the South. Finland’s FINNIDA and Sweden’s SIDA have funded plantation projects in the Philippines, Thailand, Sri Lanka, Indonesia, Vietnam, Mozambique and Tanzania. In each case Finnish and Swedish firms were involved in the implementation of the project (Kerski 1995: 146). Northern aid projects provide contracts for other Northern companies as well as companies from the donor nation. For example, in 1991, Stothert Enterprises Private Ltd., from Canada won a US$4.2 million three-year contract funded by SIDA to provide technical assistance to the Bai Bang pulp and paper mill in Vietnam. The Canadian government sees this as a “foot in the door” of the lucrative world of development aid in Vietnam. The Stothert case demonstrates how a company can establish a foothold in Vietnam through a multilateral-funded (sic) project, where payment to the firm is secure, thereby reducing the risk involved. As a result, this contract will allow Stothert to learn the “rules of the game” in Vietnam and to pursue other opportunities in the country (Canadian government no date). neither fortuitous, nor a hint of incipient neo-colonialism but a reflection of the support given by donor agencies to international development by encouraging their own national institutions to undertake research (e.g. germ-plasm exploration, conservation, evaluation, etc.) for the benefit of many developing countries (Burley 1987: 71). Whether the funding is actually to the benefit of “many developing countries” is open to question, as is the denial of “incipient neo-colonialism”. This is top-down “development” at its extreme, with Northern based “experts” conducting research paid for by “aid” money from Northern governments, with the likelihood of the ultimate beneficiaries also being companies and industries from the North. In Finland, the Premixed Concessional Credit Scheme provided a way of boosting exports of pulp and paper machinery to Asia at a time of recession in Finland. The state Finnish Fund for Industrial Cooperation is backing the partly state owned Finnish paper company Enso Gutzeit in a joint venture to “develop” a 1,390 km2 acacia pulpwood plantation in western Kalimantan (Kerski 1995: 147). The US Overseas Private Investment Corporation (OPIC) and Export Import Bank are helping to smooth an inter-governmental deal which will result in US industry sending billions of dollars worth of pulp and paper, logging and other machinery to Siberia, in exchange for Russian wood (Kerski 1995: 147). OPIC has also directly funded US logging operations in Siberia’s Far East (Carrere and Lohmann forthcoming). Britain’s CDC was set up as the Colonial Development Corporation by an Act of Parliament in 1948. Although CDC no longer receives grant aid from the government, of a total investment of over £1,600 million in 1993, around 45 per cent was in the form of interest free loans from the ODA, the remainder coming largely from profits made on aid budget seed money (CDC 1994: 18). CDC’s projects include £120 million invested in industrial forestry companies in Africa, Asia, the Caribbean and the Pacific. CDC specializes in areas where private investors may be reluctant to tread, aiming to “improve the investment climate to pave the way for increased private investment in the longer term” (CDC 1994: 9). It is ironic that CDC survives as a public sector “aid” agency based in the UK, a country that has done more than most to promote privatisation in both the South and the North. In 1991, CDC loaned £15 million to the Thai company Soon Hua Seng towards their project to plant 46,500 hectares of Eucalyptus in east Thailand (Ryan 1992). A coalition of 220 Thai NGOs (represented by the NGO Coordinating Committee on Rural Development) wrote to CDC pointing out that Soon Hua Seng were not a reputable company, and that two years earlier, their subsidiary Suan Kitti Reforestation Company was convicted of denuding 5000 acres of pristine forest, in preparation for Eucalyptus planting (NGO-CORD 1992). CDC however, continued to fund the project, arguing that criticism of the Soon Hua Seng project should be directed at the “promoter and shareholder” rather than CDC (Eccles 1992). Although CDC is sponsored by the ODA and in theory is accountable to Parliament, in practice it is almost completely unaccountable to the public, either in Britain or in the recipient countries. Baroness Chalker of Wallasey, the UK minister for Overseas Development explains that “ODA does not seek to second guess CDC’s decisions on individual projects. These are the responsibility of the Board, who are accountable for their decisions” (Chalker 1992). However, according to CDC staff, “CDC is accountable to its sponsoring ministry the Overseas Development Administration, and through them to Parliament” (Magee 1995). It is certainly not possible to give you details of projects that CDC is looking at in Vietnam. … The agreement we reached with the Government of Vietnam is between CDC and the Government and not for general release. Any reports produced for CDC are entirely for our own use (Magee 1994). Multilateral development banks such as the World Bank, the Asian Development Bank, the African Development Bank, the Inter-American Development Bank and the European Bank for Reconstruction and Development also hand out lavish “aid” packages to consultancy, construction and machinery firms. Between 1984 and 1994 the World Bank provided finance for the establishment of more than 3.3 million hectares of largely industrial tree plantations, at a cost of US$1.6 billion, in countries including China, India, Bangladesh, Algeria, Tunisia, Zimbabwe, Kenya, and Peru (World Bank 1994: 18). This amounts to almost 10 per cent of all tropical and subtropical plantations (World Bank 1991: 68). Northern firms have a particular advantage in competing for these handouts. A satellite industry of consultants – many ex World Bank staff – has appeared to help supply inside information on multilateral development bank procurement (Kerski 1995: 147). Each month the World Bank offers Business Briefings in Washington and Paris for companies wishing to compete for business opportunities arising from Bank supported projects. The meetings are held in the North, for Northern businesses and the Bank is not coy about who should attend such meetings – “firms interested in expanding or developing international business opportunities in all types of manufacturing, civil works, and consulting … all companies can profit from World Bank generated business” (World Bank no date). The World Bank’s policy on forestry investments has evolved since the late 1970s. Before then the Bank viewed forests simply as sources of capital to support growth in other sectors of the economy, and lending to the forestry sector was therefore entirely on industrial utilization and investment in new plantations of fast-growing, usually exotic species with ready markets (World Bank 1994: 33). In 1978 the Bank produced a Forestry Sector Policy Paper, and since then, Bank rhetoric at least, has focussed on the role of forestry in relieving rural poverty. This Policy was updated in 1991 with an increased focus on the “adequate planting of new trees and the management of existing tree resources to meet the rapidly growing demand for the products and services that forests and trees can provide for the rural poor in developing countries” (World Bank 1991: 10). However, although the share of lending for industrial forestry projects has decreased to 20 per cent of total forestry lending, the actual amount lent has increased by 12 per cent to an average of over US$100 million per year, with around US$240 million more currently in the pipeline (World Bank 1994: 13). Since the 1991 Policy the Bank has funded no commercial logging in primary moist tropical forests, which reveals an even larger shift towards industrial plantation projects funded by the Bank. The Operations Evaluation Department of the World Bank produced another forestry report in 1991 reviewing the Bank’s forestry portfolio. The report stated that although economic rates of return for the twenty forestry projects, for which data was available, were almost all over 10 per cent, “the overall forestry portfolio had been unsatisfactory in terms of its social impact, institutional development, and sustainability” (World Bank 1991: 34). The Bank’s attitude to demand for rural wood products is quite clear: “The achievement of a more sustainable balance between supply and demand requires actions to reduce the demand for fuelwood and other local wood uses and to increase supply by encouraging the planting and husbandry of trees” (World Bank 1991: 14). Demand for fuelwood is to be reduced through the use of more efficient household wood stoves, the use of kerosene or other alternative fuels, more efficient marketing systems, and investment subsidies for alternatives to wood burning (World Bank 1991: 49). On the other hand, “The demand for industrial wood in both developed and developing countries will continue to increase” (World Bank 1991: 30). There is no hint that demand for industrial wood products such as paper should be reduced. According to the Bank, that demand must be met at all costs. Involving people can be expensive and in some cases can paralyse decisionmaking, hold public investments hostage to unproductive NIMBY (“not-in-my-backyard”) activism, and reinforce local power structures. … Public agencies need training in participatory approaches and clear indication from senior management of the importance of participation (World Bank 1992: 15). What is viewed by the Bank as “NIMBY activism” in many cases is in fact a struggle by villagers to defend their livelihoods, and to retain control over resources at a local level. The Bank therefore provides training for Public agencies in order to allow the right kind of participation: allowing villagers to feel involved, without allowing them any control over the development process, which is designed in board rooms in Washington and the capital city of country concerned. FAO has played an important role in promoting the commercialization of tropical forestry generally (Marshall 1991: 66), and the industry with which FAO’s forestry department has had the “longest and deepest involvement” is the pulp and paper industry (FAO 1985: 59). From its inception, FAO has produced studies aiming to facilitate investment and production in the pulp and paper industry in a wide range of tropical countries. It is evident that the governments of most of these [tropical] countries would require financial and technical/managerial assistance if their plans are to be implemented. FAO is prepared to assist in the bringing together of governments and potential investors, in the hope that these plants would be established (King 1975:5). FAO’s promotion of the pulp and paper industry proved to be very influential, and two years later King reported that, a large number of Southern governments had approached the FAO to study the feasibility of establishing “some type of pulp and paper factory, of one kind or another” (King 1977: 2). Many Southern governments have set up or augmented state institutions which subsidize the growth of local and foreign commercial elites. 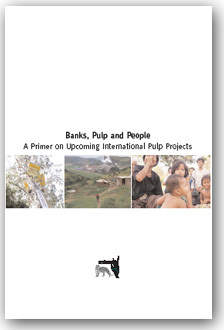 Thailand’s Board of Investment, for example, which was originally set up under the aegis of the World Bank, has provided tax writeoffs, technology import exemptions and rent-free loans to pulpwood or pulp industries, as well as providing the infrastructure necessary for such development (Kerski 1995: 147). In Indonesia, where 70 per cent of the land area is managed by the state department of forestry, land rents for plantations are as low as US$0.30 per hectare per year, and replanting funds are available for plantation businesses at the expense of non-industrial community-based land uses (Carrere and Lohmann forthcoming). By 1992 the department of forestry had accepted 353 applications for plantations covering a total of 12.5 million hectares (the largest 37 applications covering 7 million hectares) despite a published target of 6.2 million hectares of HTI estates by the year 2000 (WALHI and YLBHI 1992: 23). Economic theory tells us it’s all right to subsidize education because it benefits the whole society. But while eucalyptus and pulp and paper industries earn profits for some, they cause problems for society. Therefore, economic theory tells us, they should be taxed. But instead the government does the opposite. This is a matter of influence and power (Pasuk 1995 cited in Carrere and Lohmann forthcoming). In addition to such direct promotion of industrial plantations in the South, Northern biased research organizations provide the scientific background for tree planting. These research organizations often receive funding directly from the pulp and paper industry, and the Oxford Forestry Institute, for example, is currently negotiating research funding from Shell International. Without such scientific research, the plantation boom in the South would not be possible. Historically, forestry research has been focussed on a narrow range of primarily industrially valuable species. A wide range of scientific literature is available on Australian species for example, such as Eucalyptus or Acacia, but little is written in the literature on Tephrosia candida say, which is commonly used in the north of Vietnam as an agroforestry tree. Some of the research organizations involved in the promotion of industrial tree species particularly in Vietnam, are examined below. CSIRO’s Division of Forest Research began in 1921 as the Australian Government’s Commonwealth Forestry Bureau, and was incorporated within CSIRO in 1975. In the 1960s, the United Nations requested Australia to intensify seed collection of eucalypts for developing countries. Today, the Government research and development programme is complemented by a commercial export industry which supplies seeds to governments and development aid agencies (Cooper 1983: 32). About 75 per cent of CSIRO’s funds come from government and most of the remainder from industry and other groups. CSIRO’s primary functions are to assist Australian industry, contribute to Australia’s national objectives and facilitate the application of the results of research. … It maintains close links with its industrial partners and concentrates on strategic research likely to be of medium term benefit to industry (CSIRO 1994). The Australian Tree Seed Centre, a unit within CSIRO’s Program on Australian Tree Resources, fulfills several important roles in the promotion of industrial plantations. It collects high quality, source identified seed of commercially promising Australian trees for research purposes; provides professional advice on species choice and seed supply; provides technical information on species of value; and makes the materials widely available (National Research Council 1991: 120). During 1982-1985 the centre undertook 45 major seed collecting programmes, about half of which involved the collection of Eucalyptus seed (National Research Council 1991: 120). Today the Centre stores around 35,000 genetically different accessions from over 600 species (Booth 1996). The Australian Tree Seed Centre collaborates with Australian and international donor organizations in arranging and distributing seed for international provenance trials of important commercial species. Projects include Seeds of Australian Trees funded by the Australian Centre for International Agricultural Research (ACIAR), providing seed, information and training to the South, and a UNDP/FAO project (FORTIP) which aims to improve the productivity of man-made forests (Arnold and Midgley 1995: 122). Computer programmes have been created relating tree species to sites – presented in the form of a map of Indonesia, for instance, indicating potentially suitable growing sites for around 40 species (Booth 1996). In 1989 Stephen Midgley of CSIRO travelled to Vietnam, Laos and Cambodia on a technical advisory visit for the Australian Tree Seed Centre. At the time, Vietnam’s national afforestation target was 3 million hectares over 15 years, with Eucalyptus, Acacia and Casuarina species forming more than 60 per cent of the reforested area. Midgley recommended that Australia should continue to provide technical literature, and establish seed orchards in Vietnam (Eucalyptus camaldulensis, E. urophylla, Acacia auriculiformis, A. mangium, Casuarina equisetifolia). “It would seem logical that Australia, with the appropriate scientific expertise and genetic material, could make a unique contribution in this regard” (Midgley 1989: 29). There are two driving forces behind the use of Australian species in Vietnam: first is the ready supply of good quality seeds of known provenances from Australia; and second is the comparative lack of scientific knowledge of planting or utilizing indigenous species, as well as poor seed quality and supply for indigenous species. Australian species have the added advantage in that they “… offer chances of future development of industrial plantations” (Midgley 1989: 31). However, there were other potential benefits to CSIRO from working in Vietnam, beside the provision of “aid” funded expertise and seeds. CSIRO was interested in the possibility of seed exchange, particularly of the Vietnamese species Pinus krempfii – “a rare species from the highlands of central Vietnam. This species is of considerable scientific interest taxonomically and the provision of botanical and seed material to Australian research institutions would represent a fine collaboration” (Midgley 1989: 39). From the Australian perspective this is no doubt true. ACIAR was established in 1982, “to mobilize Australia’s research expertise to help solve problems limiting agricultural production in developing countries” (ACIAR 1991: 3). In 1984 ACIAR established a forestry programme as a result of which several species and provenances of Australian trees have been tested on a range of sites, including in Thailand and China. ACIAR plans to apply the results of these tests to other countries in the region (Midgley et al 1991: 1). ACIAR contracts scientific organizations in Australia to set up collaborative research projects on problems of “mutual interest” with counterparts in other countries, and aims to allocate funds to conduct research to benefit from Australia’s tree genetic resource “that gives Australian scientists a comparative advantage in the search for appropriate species for the reforestation effort in degraded tropical environments” (Boland and Turnbull 1989: 13). An example of the application of this “comparative advantage” is the ACIAR funded forestry project in Laos with the unambiguous title, Improving and Sustaining Productivity of Eucalyptus in South East Asia. CSIRO was commissioned to undertake the project in 1992, which involves the introduction of fast-growing trees from species and provenance trials in Thailand to Laos (Pinyopusarerk and Chandler 1993: 2). 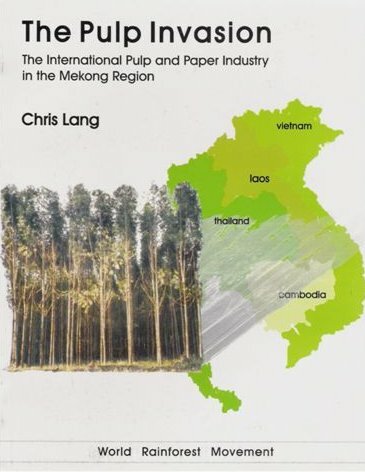 This research dovetails well with the fact that fast-growing tree plantations have become increasingly controversial in Thailand in recent years, and some pulp and paper operations in Thailand are looking at the possibility of expanding their operations into Laos. For example, the European Overseas Development Corporation (EODC) a British company based in Hong Kong, and the majority share holder in the Thai Phoenix Pulp and Paper Company, controls 39,000 hectares of Eucalyptus plantations in Laos. The plantations were established five years ago to supply the Phoenix mill in Khon Kaen, north east Thailand (Geary 1996). Clearly the results of CSIRO’s research will be of great interest to Phoenix and EODC. In 1991, ACIAR was commission by the Consultative Group on International Agricultural Research (CGIAR) to prepare the ground for the establishment of CIFOR. 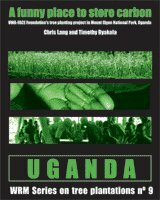 The legal establishment of CIFOR was subsequently sponsored by the governments of Australia, Sweden, Switzerland and the United States in 1993, and it was funded by 17 international donors (Sayer 1994: 33). The idea of a centre focussed specifically on forestry research was developed from a series of meetings arising out of the Tropical Forestry Action Plan (TFAP). In July 1987 in Bellagio, Italy an international strategy meeting was organised by the Rockefeller Foundation, FAO, the World Bank, UNDP and the World Resources Institute (WRI). 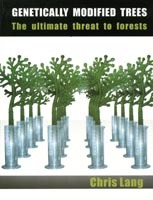 The perceived weakness of tropical forestry research came out of the meeting as a major hindrance of TFAP implementation, and in 1988 the Rockefeller Foundation, the World Bank, the UNDP and FAO sponsored the International Task Force on Forestry Research (ITFFR), which suggested expanding the mandate of CGIAR to support forestry research, and creating a centre to coordinate tropical forestry research (Sayer 1994: 32-33). promote the sustained well-being of people in developing countries, particularly in the tropics, through collaborative strategic and applied research in forest systems and forestry, and by promoting the adaptation of improved technologies and management practices (Sayer 1994: 33). In practice an important role of CIFOR is to conduct research of key interest to the pulp and paper industry, using public funding. It is revealing to compare the proposed areas of research highlighted by the ITFFR, with the areas of research as finally implemented at CIFOR. “Tree breeding and intensive forestry”, for example, becomes ?reforestation of degraded lands? (Sayer 1994: 34, Buckman 1990: 42). Included within the ?reforestation? programme is the development of “techniques for characterizing genetic variation and relating it to physiological and morphological adaptations” (Sayer 1994: 34), or put more simply, the fitting of tree characteristics to industry needs through genetic research. Another area of the same programme involves research into the physiology and biochemistry of plant material for improved vegetative propagation. As Zobel points out, vegetative propagation is not a breeding method to produce better genotypes, it is only a method to mass produce desired trees and get the increased benefits by using known good genotypes (Zobel 1993: 140). Such mass production is of far more value to industry than it is to villagers, who often utilize a wide range of tree characteristics anyway, rather than the narrow demands of industry. Such research into tree breeding and intensive forestry is the forestry equivalent of “green revolution” research into rice, wheat and other food crops (also carried out by CGIAR centres), and involves “provenance testing, tree breeding, vegetative propagation, pest control, fertilization and all of the practices necessary to produce intensively high yielding trees” (Buckman 1990: 42). The green revolution has been criticized for reducing crop genetic diversity; increasing vulnerability to pests, soil erosion, water shortages; reduced soil fertility; displacement of farmers; rural impoverishment; encouraging farmers’ dependence on external expertise and inputs; and actually exacerbating hunger in the South (e.g. Shiva 1991: 57). There is a real danger that the beneficiaries of CIFOR?s research will be commercial interests rather than the poor that CIFOR is claiming to target. The CTFT is a department of the French foreign aid agency Centre de Cooperation Internationale en Recherche Agronomique pour la Developpement, and has its origins in French colonial tropical forestry agencies. CTFT collaborates with and receives some support from FAO, in addition to French government and European Union funding (National Research Council 1991: 119). CTFT concentrates on a small range of mainly industrial species, including Eucalyptus spp., Pinus caribaea, Tectona grandis, Gmelina arborea, Acacia mangium and A. auriculiformis (National Research Council 1991: 119). CTFT (along with CSIRO and other forestry research institutions) carried out research in the early 1970s into the pulping of mixed tropical hardwoods, research that was to have a major impact on both the pulp and paper industry and forest cover in the tropics. In Vietnam, CTFT is acting as technical advisor on an ambitious joint venture between a French company, VMH, and Liksin, a Vietnamese printing and paper company. The total proposed investment will be US$17 billion, which will include new pulp mills, establishment of new port facilities, as well as a huge expansion in raw material plantations. The project plans to establish 200,000 hectares of Eucalyptus plantations in the south and central highlands of Vietnam. The CTFT input began in early 1990 and involved the establishment of a research and training centre, in collaboration with the Forest Science Institute of Vietnam (Midgley 1989: 51). So far only small areas of plantation have been established. Several Northern based NGOs provide ideological support for the expansion of the pulp and paper industry in the South. One of the NGOs most involved with the debate on the expansion of pulpwood plantations in the South is the London based International Institute for Environment and Development and its role is examined below. IIED was formed in 1971 by Barbara Ward. The current executive director, Richard Sandbrook was a founder member of Friends of the Earth UK (Pearce 1991: 49). He refers to the “debt crisis” as the “greatest moral issue of the day” (Pearce 1991: 280), yet although IIED has produced “economic, environmental and social analyses” (Bass 1996) of the plantation boom in the South, it has failed to criticize corporate and donor involvement and thus helped legitimize yet more loans and “aid”, and thus yet more debt. IIED’s tacit promotion of industrial plantations can be illustrated through three recent examples: a consultancy with Shell International in Thailand; the book Plantation Politics; and the forthcoming publication Paper, Towards a Sustainable Cycle. In 1990, Caroline Sargent, then director of IIED’s Forestry and Land Use programme, accepted a consultancy with Shell International to examine their Khun Song plantation project in Chanthaburi province, Thailand. The aim was to carry out a social and environmental study of the proposed planting of 20,000 hectares predominantly with Eucalyptus camaldulensis on a five year rotation (Sargent 1990: 21). The report does not question whether the plantation should go ahead, but looks instead at ways of implementing the plantation. … the widespread and frequently strong feeling that the villagers do not want to be dependent upon, or controlled by, an outside agent such as Shell. … People wish to have land to give to their children … Land holders not wanting to sell land rights foresaw increased pressure if their land became surrounded by the Shell plantation. Those who would consider selling did not envisage staying in the concession area, but would move elsewhere in preference to becoming landless employees of Shell. They would either move into the forest, or buy usufruct elsewhere (Sargent 1990: 58). The villagers’ objections to becoming dependent on Shell cannot be addressed by Sargent’s “recommendations to improve project acceptability”. These include: public relations, demonstration plots, expertise in bee-keeping and fungus growing to be passed from Shell to the villagers; a guaranteed price for Eucalyptus; technical and financial support for Company (i.e. Shell) village construction; and a system of contract farming to be developed. Sargent further recommends intercropping Eucalyptus with agricultural crops, in order to improve local opinions toward the project. However, the suitability of Eucalyptus camaldulensis as an agroforestry tree must be in question (except in areas of very high rainfall) due to its tendency to lower the water table where it is planted (Huxley 1996). Lohmann reports that Thai villagers refer to the tree as the “selfish” tree (Lohmann 1990a: 10). Villagers would only be able to farm the land before the canopy closed at two or three years, at which point they would have to move to other land. Due to the level of protest in Thailand, as well as increasing violence locally and scandals associated with the project, government approval was delayed, and Shell was forced to drop the project (Carrere and Lohmann forthcoming). Further pro-industry analysis of plantations came in 1992, with the publication of Plantation Politics, forest plantations in development, by two IIED staff, Caroline Sargent and Stephen Bass. The book is pro-plantation “by conclusion, not by ‘intent'” (Bass 1996), but aims to investigate how plantations can be made more socially acceptable, through such techniques as establishing guidelines, participation and collaboration with rural people affected by the proposed plantations. Carrere (1993: 195) however, suggests that a more appropriate subtitle would have been Guidelines for corporate investment in the South. Three main arguments are presented in the defence of industrial plantations in the book, each of which avoids the point that decisions to establish tropical plantations are the result of a complex series of Northern dominated political processes. First, Bass and Sargent argue that plantations are necessary in order to meet current and projected demand for wood products, which cannot be met from natural forest regeneration. An ethical discussion of levels of current wood consumption in the North is rejected in the introduction as not “central to the purpose of this book” (Sargent and Bass 1992: 10). Although Bass states that an ethical “discussion is key … and IIED is active in it” (Bass 1996) does not justify its omission from the book. Wasteful Northern consumption of wood and paper is accepted in the book “as an unchallengeable condition which the South has to accommodate with its land and labour, regardless of its own needs” (Carrere 1993: 195). Second, Sargent and Bass argue that corporations will inevitably be involved in plantation development because corporations are best able to realize economies of scale, in clearing large areas of land, planting and managing trees, and corporations are better than governments at increasing competition and efficiency (Sargent and Bass 1992: 164). In fact corporate tree plantations are only viable through huge public subsidies, the mechanisms behind which are explained above. Third, the authors do not take “the environmental impacts of tree plantations … seriously into account” (Carrere 1993: 196). Sargent quotes farmers interviewed during her study for Shell in Thailand as saying that Eucalyptus gives off a “poison gas” which burns the ground. Clearly farmers are referring to the strong smell of Eucalyptus oils and the (unrelated) fact that they have had difficulty growing crops adjacent to Eucalyptus plantations. Sargent dismisses such observations as “attributing false properties to an exotic species” (Sargent and Bass 1992: 94). The undeniable and important impacts of large scale plantations (whether of exotic or native trees) are not discussed in any detail. Plantation Politics acknowledges criticisms of Shell’s proposed project in Thailand, but describes them as “public criticism in its [Shell’s] learning process (e.g. Lohmann 1990)” (Sargent and Bass 1992: 88). Presumably Sargent is hoping that Shell will learn how better to deal with criticism as it gains more experience with bigger and more damaging plantations in the South. 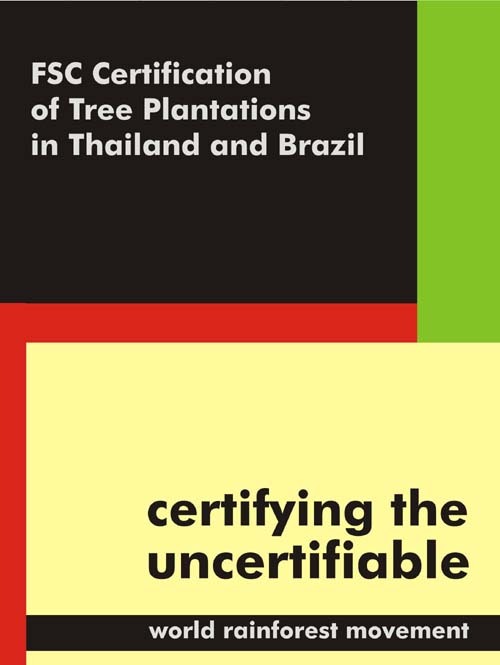 Lohmann’s criticism of “reforestation” in Thailand is not criticism of a “learning process”, but is a critique of the structural processes involved with Northern corporations enclosing large areas of the South in order to meet the North’s demand for cheap supplies of forest products. During the 1992 Earth Summit in Rio, Richard Sandbrook met with various members of the World Business Council for Sustainable Development (WBCSD). These included Erling Lorentzen, the chairman of Aracruz Cellulose SA, the pulp and paper company involved in planting 122,000 hectares of clonal Eucalyptus plantations in Brazil (Evans 1992: 80). From these discussions arose the idea that IIED should produce an analysis of “The Sustainable Paper Cycle”, funded by WBCSD. The results of this analysis will be published this year, entitled Paper, Towards a Sustainable Cycle. Although “in order to secure utmost credibility” WBCSD contracted IIED as an “independent research institute”, IIED are, in fact, firmly enmeshed in the pulp and paper industry’s friendly circle. Jaakko Pöyry Consulting are listed in their annual report as one of many “consultants and collaborators” and Sir Peter Leslie of the Commonwealth Development Corporation is a member of IIED’s board (IIED 1995a: 21). Sir Peter Leslie was invited to IIED’s board after IIED illustrated the environmental and social problems with a proposed CDC teak plantation in Tanzania. “Leslie was very concerned with the lack of environmental and social analysis within CDC as exposed by IIED” (Bass 1996). So when a British “aid” organisation is “exposed” by IIED, the Chairman is invited to the IIED board. When Thai villagers are threatened with displacement and dependency by an Anglo-Dutch Multinational, IIED propose that the project should go ahead, and aim to co-opt and pacify villagers rather than invite them to sit on the board. A significant portion of IIED’s funding comes from other institutions involved with the promotion of industrial plantations in the South. In 1994/5, out of a total of £4,095,905, IIED received £2,266,051 from Governments and Government Agencies (such as the Canadian International Development Agency (CIDA) and the Swedish International Development Authority (SIDA)), £78,779 from Foundations and Corporate Foundations (such as the Ford Foundation and Shell International), and £641,194 from International Agencies and Multilateral Aid Agencies (including the World Bank, and FAO) (IIED 1995a: 16-18). The list of advisers who reviewed the ‘Sustainable paper cycle’ research “to ensure its independence” reads like a list of characters from the pulp and paper promotion play. It consists of thirteen men, three from the pulp and paper industry (including Erling Lorentzen, Aracruz Cellulose and Jiro Kawake, New Oji Paper Company), three Northern university academics, two pulp and paper industry researchers, four government officials (from Canada, Norway, Indonesia and the European Commission), and one consultant (Dr. Jaakko Pöyry himself) (IIED no date: 30). Several draft documents produced for the study were published in 1995 and indicate a very thorough study of the international pulp and paper industry, involving surveys of corporate practice and a literature review. However, the majority of the literature has been produced by Northern biased forestry research organizations, NGOs and others involved in the promotion of the pulp and paper industry. This Northern bias is revealed at important points in the study in statements such as “consumption justifies production” (Robins 1995: 4). According to the study, the frequency of conflict between local populations and industrial developers “demonstrates the great importance of providing adequate clear information at the local level” (IIED 1995b: B13). The local populations involved in such conflicts might prefer to be listened to in the first place, rather than being given “clear information” on a project designed by and for industry. Similarly, the “NGO perspective” on forestry and fibre sourcing is analysed, and NGO perceptions, policy objectives and activities are summarized (IIED 1995b: E89-92). According to the study, the global scene is dominated by three large international groups, Friends of the Earth, Greenpeace and World Wide Fund for Nature (WWF) (IIED 1995b: E87). This perception is typical of large US or Europe based NGOs, but is of little relevance in the Thai NGO movement, for example. The views of Southern based NGOs (or even coalitions such as the World Rainforest Movement which includes NGOs from countries of the North and the South) are not included in the IIED study. IIED’s statement that “there is clearly scope for more cooperation between the paper industry and NGOs” (IIED 1995b: E87) becomes a statement tinged with imperialism in this context. In 1993, WWF and Shell International collaborated to produce a 12 volume study Tree Plantation Review which “examines the broad range of economic, social and environmental issues affecting the development of forestry plantations” (Shell/WWF 1993a: iii). An aim of the study was to “highlight the need for tree plantations” and rather than question skewed consumption, or power balances, the collaboration concludes that although there are certain social and environmental problems associated with large scale industrial tree plantations, these can be resolved through the careful implementation of plantation guidelines. A set of guidelines is duly included in the WWF/Shell study as “A contribution to the debate on environmentally and socially responsible planning and management practices for tree plantations” (Shell/WWF 1993b). The level of the “debate” is indicated in the establishment of “principles” for the guidelines. Section 2.1 of the principles involves the “need for guidelines”, followed swiftly by section 2.2, the “need for plantations” (Shell/WWF 1993b: 3). The need for a debate on whether Northern industrial companies and Northern NGOs have a right to dictate that plantations should be established in the South in order to meet Northern demands is omitted from the principles. As Lohmann observes, the pulp and paper industry is well aware that guidelines will appeal to Northern educated observers brought up to believe that problems can be solved through “correct” formulation of “theory” and “objectives”, leading smoothly onto good “practice” or “implementation”. The view is especially appealing to Northern based NGO staff and foresters whose employment is based on these assumptions (Lohmann 1994: 8). Such guidelines are of little value to villagers whose livelihoods are threatened by Eucalyptus plantations in northeast Thailand, who are more likely to view guidelines as an entirely theoretical exercise, and a distraction from the real political issues behind the proposed plantation (Lohmann 1994: 8).